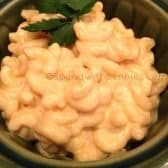 If you love rich and creamy Macaroni and Cheese then this homemade stovetop recipe is for you!! In a saucepan combine milk, garlic powder, butter and water. Bring to a boil. Add in macaroni noodles, reduce heat to low. Continue to simmer stirring frequently until noodles are cooked (about 20 minutes). Watch to make sure the liquid doesn’t completely evaporate. You can add extra milk 1/4 cup at a time if the liquid is low. Once the pasta is cooked, ensure the noodles are not dry. They should be as moist as the photo above. Stir in remaining ingredients and cover for 3 minutes.